West Windsor, N.J. – There's nothing like seeing former classmates succeed to give students a reason to believe. When transfer representatives from the School of Visual Arts (SVA) in New York City visited Mercer County Community College (MCCC) on Oct. 30, they started off with a video introduction that featured work by two MCCC photography alumni and one film alumnus. They commented on how well the former MCCC students are doing at SVA. According to Photography Program Coordinator Michael Dalton, who arranged the SVA visit, studying and working in New York City is a major goal for many MCCC Arts and Communication students. 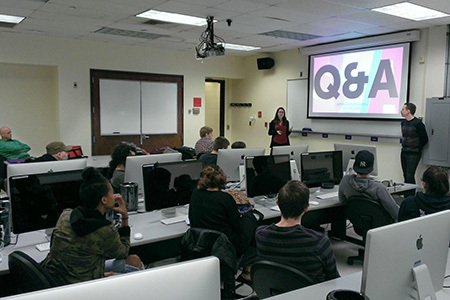 "They crowded into the computer lab to learn more about transfer to SVA and to participate in a portfolio review session," Professor Dalton said. SVA representatives described programs and transfer criteria. Among the students in attendance were those studying Advertising and Graphic Design, Photography and Digital Imaging, Fine Arts, Film, New Media, Illustration, and Digital Media Arts. Mercer's ties to SVA are have been strengthened by faculty connections to the school. Both Dalton and Visual Arts Professor Yevgeniy Fiks are SVA alumni. Fine Arts Professor Lucas Kelly completed a summer printmaking seminar there. This spring Professor Dalton will take photo students to New York to meet with the chair of the SVA Photography program and to attend a workshop being held specifically for MCCC Photography students. "New York City is in our backyard," Dalton said. "It's where many of our students want to be and they are proving they have what it takes to get there and succeed."